“Pacchero” is a popular term still used which means slap. 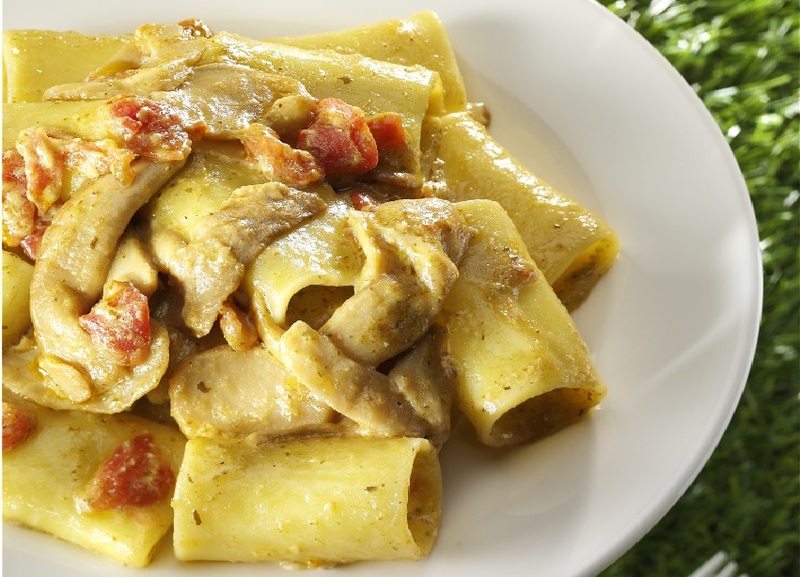 The origin of the name of this particular type of pasta, paccheri, is attributed, to the noise (like a slap) that they generate while mixing them in the tureen full of sauce. A tasty sauce can only come from different regional traditions and the result is guaranteed. Bring the water to boil in a saucepan and dip the red tomatoes, previously carved on the back, for about ten seconds, then cool them in iced water. Peel the tomatoes, remove all seeds, then chop them roughly. In the meanwhile, cook the paccheri pasta “al dente” in abundant salted water. Heat the mushrooms in a skillet with a drizzle of extra virgin oil and thin with a little of the cooking water. Drain the paccheri pasta and toss with the prepared mushroom sauce adding the pesto. Serve with a topping of chopped tomatoes.